I am happy to be playing along with the PTI January Blog Hop today. I was inspired by the cookie in the middle, as it looked just like one of my favorite Fillable Frames die. I used Garden Grace flowers and leaves and a die cut word love to decorate a black fillable frame die cut. I added a few dots with a white gel pen. It looked a little plain on top of a plain black card base, so I added more Garden Grace flowers. 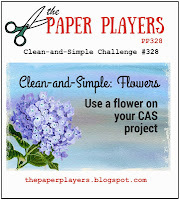 I am also entering this card at Addicted to Stamps and More #226: Anything Goes and Paper Players #328: Clean and Simple Flowers. I'm keeping it short today as there is so much to see on the hop. Gorgeous card, Joyce! Great stamp and die choices. I'm traveling in our small RV for 7 weeks and am missing paper crafting/challenges. Going to be in San Diego most of February. This is beautiful! Great take on the challenge! Another Fillable Frame here - this is just great. I have it since years and it´s great to see it in action. Thanks for the Inspiration. Your card is very beautiful with the flower bouquet. Really beautiful card Joyce. I am trying to figure out what you did with the background??? An embossing folder or did you score the line? Looks amazing and the frame die is perfect. Very pretty, Garden Grace is one of my favorite stamps and I love what you've done with it here! Oh Joyce, this is perfect! Love those Garden Grace flowers and leaves peeking over onto the black fillable frame. beautiful take on the challenge photo. The flowers are so lovely. So much great inspiration on this blog hop! Thanks for sharing. 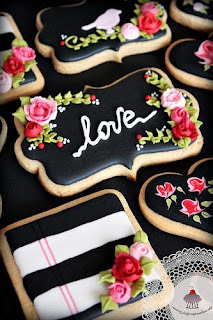 So beautiful Joyce....your flowers are as gorgeous on your card as they are on the cookie. So sweet! Beautiful Joyce! Love the scored background - reminds me of a garden trellis. The black frame on the black background with the white love die-cut and Garden Grace worked beautifully for this challenge. Your pretty flowers are flowing freely and the little white gel pen dots finished it off, Joyce. This is lovely, Joyce. The scripty sentiment looks like frosting and I love the addition of the white dots. Oh my, your card is just as gorgeous as that cookie! 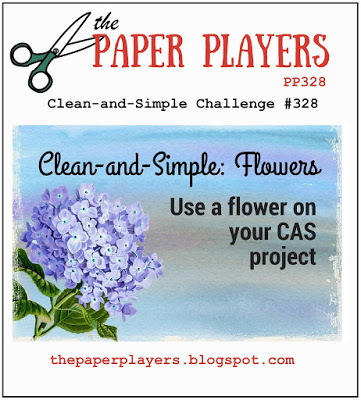 Love the layout and the falling flowers...thank you for joining us at The Paper Players! Love the way you've used the fillable frames die and tucked the flowers into it!! Pretty card Joyce! Love those sweet flowers & your beautiful card, Joyce! Love, love the garden grace and how it is layered with your sentiment. The textures on your black background add just the right touch! Beautiful!! Beautiful! 'Garden Grace' is just so pretty ... and the sentiment and little white dots add the perfect finishing touches to this lovely card! This is a fantastic take on that luscious inspiration photo! I love this! What gorgeous embossing on the black and those sweet flowers just pop! SO pretty!!! Loving all that texture!! Thanks so much for playing along at The Paper Players. The little white dots you added really add such a lot to the success of your design, Joyce!!!! The pretty pink flowers are beautiful against the black!!! You're right...your Fillable Frames die cut looks just like that sweet cookie :) Love your choice of blooms on this card, too! Such a striking card, Joyce!